processing and preservation, LCD display function. Meter provides valuable information to help utility companies and users reduce cost and improve work efficiency such as load control, payment collection, management automation and etc. 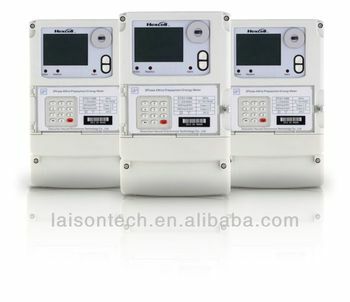 With infrared communication function and RS485/RS232 interface optional. With high surge withstand capability. The meter complies with the standards of STS IEC 62055-41, IEC 62055-51, IEC 62055-11, IEC 62055-21 and IEC 52056-21. Please directly contact us for more details. Hangzhou Laison Technology Co., Ltd.